Here's how I go about getting the mold lines off models. Most of the models I see these days have them. And by that, I mean the painted models on the table that are being used in games. Removing them is really quite simple and only adds a minute or two of time to each model. It's worth it in the end though. I can't imagine doing a commission for someone and handing them a model with the mold lines still on it. That would go over real well. Micro Mark makes a tool specifically for removing mold lines, it can be found here. 1. Do NOT use a good/Wife's/Girlfriend's toothbrush for this. 2. Always use a new blade in your X-Acto. 3. 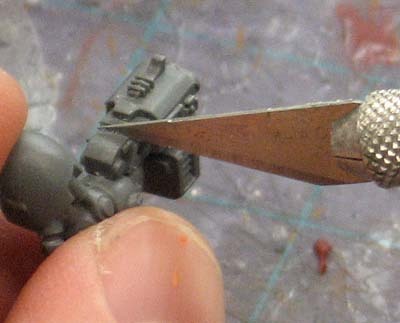 Do NOT use your plastic snips on metal models. The files are optional and I usually use them when it comes to cleaning up metal models where I have the space to get them in there. The snips are for getting your bit off the sprue without damaging the connection point. If you're not careful removing the bit initially, you can damage the bit and end up needing to fill in areas with greenstuff and we don't want to get into that. Otherwise the process is the same for plastic and metal models. To clean the mold lines of a model, we're going to use the tip of the X-Acto blade (that's why I use the particular blade I do). You really are just using the very tip of the blade too. You don't use the back 90 percent of the blade. 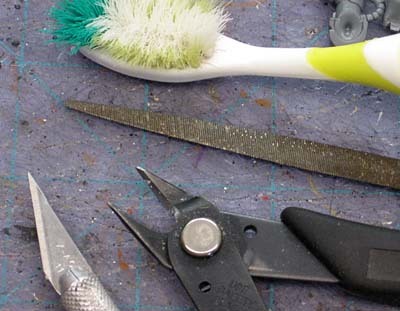 The tiny tip will allow you to get in close to the model and clean away all the mold lines. The trick to this whole process is to hold the blade perpendicular (at a right angle) to the surface of what you want to clean and apply a very light pressure while dragging the blade across the surface. Dave G _ Nplusplus has a good tip in his Oct. 8 comment below about how to hold the blade to help prevent skipping while dragging the blade. You only want to do one surface area at a time. For example, in the picture above, you would scrape downward until you reached the end of the triangle shape. Then you would place your blade at the tip of the triangle shape and then do the lower portion of the ammo box. If you try to do the whole surface of the ammo box in one pass, you'll only end up removing the fine edge along the triangle shape. Yep, that means you need to do every little angle and surface on the model individually. 1. Flex fitting and small rivets. If you apply too much pressure when cleaning these, you'll end up cutting them off. They aren't much bigger than a mold line itself so use caution around these. You can still clean them by scraping in one direction and then repeating the process in the other direction but use a VERY LIGHT touch when doing it. 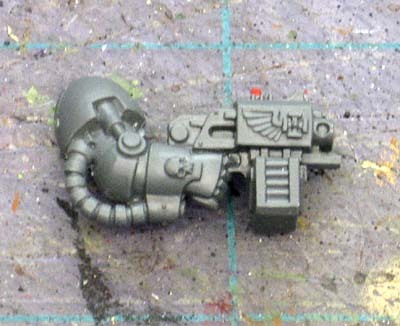 Plasma gun coils and Space Marine elbow joints are notorious trouble spots. Things that are curved will give you trouble because as you apply pressure, your blade will want to skip along missing spots or grab the surface and sink down into the plastic. Try making smooth passes with the very very tip of the blade with even less pressure until you can get the mold line removed. It might take a few passes to get it removed. If they still give you trouble, try cleaning the mold line off in small sections. Scrape a short area away and then move down and so on until you have it all trimmed away. And that's it, easy as that right? Still wondering what the toothbrush is for? It's there to get all the tiny shavings off the model once you've cleaned an area. Just give the piece a good scrub and you'll be able to tell what's been removed and what's left to do. What about using the toothbrush of a bad wife/girlfriend? Instead of a hobby knife, I use flash cleaning tool from Micro Mark. The advantage is it doesn't scalp or gouge as easily. One thing I sometimes use for tricky to reach mold lines is liquid poly glue. Hehehehe, is the very same technique I do use!!! Nice tutorial by the way. Dark Future Games linked a video of an interesting tool used for this. I can't for the life of me find it... Maybe someone from over there can remember what I'm talking about and link it. Drax: While it might seem like the "right" thing to do, I would stay away from it. Payback could be tough. Hey Dan: Thanks for the link, I added it to the post. Grajo: Thanks, I figure most people do it this way, but for those who don't know/do it, maybe this will convince them it's easy to do. Karitas: I've never heard of that before. I'd be afrais I'd ruin the model by applying too much. Lantz: If you can find the link, leet me know... I'll add it to the post here. To help prevent the blade from skipping, tilt it slightly toward the direction you're scraping. This is excellent. I wish i had found it a long time ago. 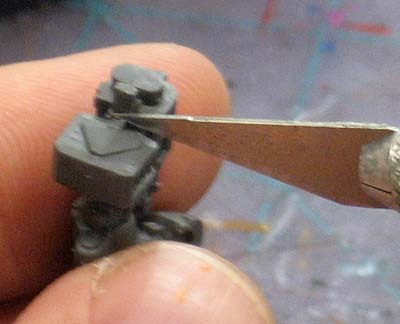 I've always used the blade to slice it off which often leads to slicing into the model. I tried this and it worked great. Makes pre cleaning the models much easier, and looks better in the end. Thanks! cpyke: Man, I wish you'd found it sooner as well. Glad you found it now though and it's helped!